You are here: Home / Brewing Guide / How Many Calories Per Coffee Cup You Are Taking? In our busy modern lives, we hardly get time to check on our health parameters, especially the amount of calories we consume through our diet on a day-to-day basis. There needs to be constant check on our calorie consumption and whether the food we intake is good for our health or not. Calories are a measure of the amount of energy we gain from our food intake. Hence it is important for us to know what are the calories we are consuming and in what quantity. Once you know these basics, it will help you in understanding what you should eat and what you should not and how to help yourself get rid of the unwanted calories in your body. These imperatives are critical for you in maintaining the right weight and keep up with your body’s metabolism. When you realise how much calories you are taking in on a day-to-day basis you will automatically become more conscious about the kind of food you opt for and modify your eating habits and exercise routines likewise. While some kind of food might have very less amount of calories in them, others will have a lot more in quantity. In this context, coffee has very less calories per cup. So compared to another kind of drinks, it is safe to say that the consumption of coffee is not bad for your health. What matters here, however, is the amount of sugar and milk you have with it. Calories refer to the measurement of the amount of energy that is provided from our food. It directly refers to the measurement of the consumption of energy that could come from eating, drinking, and physical activities such as exercising. Calorie consumption differs from person to person and even differ on the basis of countries. However, at an average, a man needs at least 2500 calories on a daily basis, while a woman needs around 2000 calories every day. In the US, a man requires an estimate of 2700 calories per day, while a woman is expected to intake about 2000 calories on a daily basis. Whether it be energy drinks, fruit juices, or caffeinated drinks – we tend to get a lot of calories from drinks, and sometimes it could exceed the amount required by our body. Most of all kinds of drinks are high on sugar and if you consume it on a day-to-day basis it could only ruin your diet plan. If you go by research data, on an average we tend to consume about 21 percent of calories from drinks on a daily basis. Aforementioned, coffee contains very fewer calories as compared to other beverages. Hence counting your calorie consumption per coffee cup is minimal or almost insignificant to the overall calorie consumption calculation. However, the numbers might go significantly up, if you add sugar, milk and another flavouring to it to satiate your taste buds. 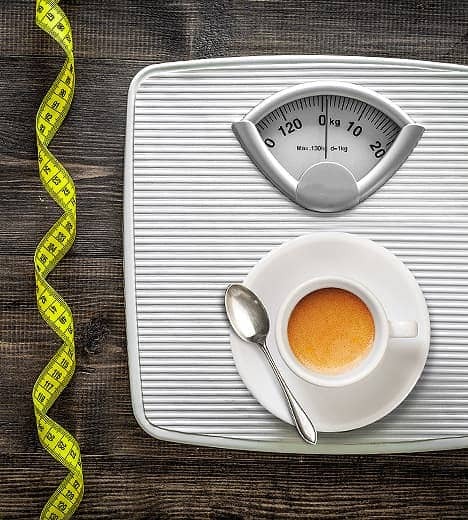 At an average, a 100g of coffee serving with skimmed milk consists of about 11 calories, and if you add sugar to it, the number will go up to a number between 34 to 38 calories per spoon of sugar. The value of the calories will increase or decrease depending on what all you add to your coffee to satisfy your taste. If you add skimmed milk to your coffee, your calorie count will increase to somewhere between 15 to 20 per cup. If you consider our opinion then the best kind of drinks, which are also safe and healthy for your body are tea, water, and coffee but with very less sugar or no sugar at all. This is one reason why a lot of coffee drinkers opt for black coffee. If you really need sugar in your coffee, you could even choose to add a sugar-free sweetener in your drink but to a considerable amount. In case of milk, go for low-fat milk or skimmed milk if you need milk in your coffee on a daily basis. Overall, it is safe to bet that coffee with less amount of sugar and milk is not bad for your health.